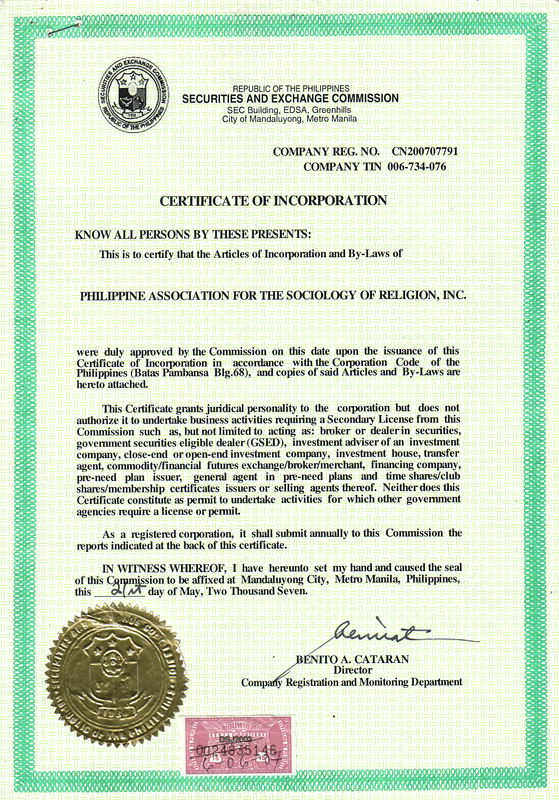 PHILIPPINE ASSOCIATION FOR THE SOCIOLOGY OF RELIGION, Inc. Section 1. Annual Meetings—The annual meetings of the members shall be held at the principal office of the association on February 1 of each year. The President shall render his annual report to the members regarding the activities of the association. The election directors shall also be held during this regular meeting. Section 2. Special Meetings—Special meetings of the members shall be called as the need thereof arises, by the Board of Trustees or the President or upon petition of 1/3 of the general membership. Section 3. Notices—Notices of the time and place of annual, and special meetings of the members hall be given either personally or by special delivery mail, or at least two (2) weeks before the date set for such meeting. The notice of every meeting shall state briefly the purpose or purposes of the meeting. Section 4. Quorum—A quorum for any meeting of the members shall consist of a majority of the members and a majority of such quorum may decide any question at the meeting, except those matters where the Corporation Code requires the affirmative vote of a greater proportion. Proof of service of the required notice of the meeting. Reading and approval of the minutes of the previous annual meeting. Section 6. Voting Proxy—Each member shall be entitled to one vote, and he may vote either in person or by proxy which shall be in writing and filed with the Secretary of the association before the scheduled meeting. Section 1. Board of Trustees—The corporate powers of the association shall be exercised, its business conducted and its property controlled by the Board of Trustees. Section 2. Qualifications—The trustees to be elected must be of legal age and members of the association. Section 3. Disqualification of Trustees or Officers—No member convicted by final judgment of an offense punishable by imprisonment for a period exceeding six (6) years, or violation of the Corporation Code of the Philippines committed within five (5) years prior to the date of his election or appointment, shall qualify as a trustee or officer. Section 4. Term of Office of Trustees—The trustees shall hold office for one year and until their successors are duly elected and qualified. Section 1. Officers—The officers of the association shall be a President, a Vice-President, a Secretary, and a Treasurer. They shall be elected by the Board of Trustees from among themselves. The Board may combine compatible offices in a single person. Section 2. Term of Office of Officers—All officers of the association shall hold office for one year and until their successors are duly elected and qualified. Section 1. President—The President shall be the Chief Executive Officer of the association. He shall preside in all meetings of the members of the association and the board of trustees. He shall execute all resolutions of the Board of Trustees. He shall be charged with directing and overseeing the activities of the association. He shall submit to the Board as soon as possible after the close of each fiscal year, and to the members of each annual meeting, a complete report of the activities and operations of the association for the fiscal year under his term. Section 2. Vice-President—The Vice-President, if qualified, shall exercise all powers and perform all duties of the President during the absence or incapacity of the latter and shall perform duties that maybe assigned by the Board of Trustees. Section 3. Secretary—The Secretary shall give all notices required by these by-laws and keep the minutes of all meetings of the members of the Board of Trustees in a book kept for the purpose. He shall keep the seal of the association and affix such seal to any paper or instrument requiring the same. He shall have custody of the members register and correspondence files of the association. He shall also perform all such other duties and work as the Board of Trustees may from time to time assign to him. Section 4. Treasurer—The Treasurer shall have charge of the funds, receipts and disbursements of the association. He shall keep all moneys and other valuables of the association in such banks as the Board of Trustees may designate. He shall keep and have charge of the books of accounts. He shall also perform such other duties and functions as may be assigned to him from time to time by the Board of Trustees. He shall post a bond in such amount as may be fixed by the Board of Trustees. Section 1. Qualifications for Membership—The board shall determine the qualifications of an applicant for membership. To obey and comply with the by-laws , rules and regulations that may be promulgated by the association from time to time. Any member of the association may file charges against a member by filing a written complaint with the Secretary of the association. The Board of Trustees shall call a special meeting to consider the charges. The affirmative vote of majority of all the trustees shall be necessary to suspend a member; Provided that where the penalty is expulsion, the affirmative vote of majority of all the members of the association shall be necessary. Section 1. Funds—The funds of the association shall be derived from admission fees, annual dues and special assessments of members, gifts, or donations. Section 2. Disbursements—Withdrawal from the funds of the association, whether by check or any other instruments shall be signed by the Treasurer and countersigned by the President. If necessary, the Board of Trustees may designate other signatories. Section 3. Fiscal Year—The fiscal year of the association shall be from January 1st to December 31st of each year. Section 1. Form—The corporate seal of the association shall be in such form and design as may be determined by the Board. Section 1. Amendments—These by-laws, or any provision thereof, may be amended or repealed by a majority vote of the members and by a majority vote of the Trustees at any regular or special meeting duly held for the purpose. Adopted this 15th day of March, 2007 in Manila by the affirmative vote of the undersigned members representing a majority of the members of the association in a special meeting duly held for the purpose.